Nalodeine, also known more commonly as N-allylnorcodeine, is an opioid antagonist (specifically, an antagonist of the μ-opioid receptor) that was never marketed but is of notability in having been the first opioid antagonist to have been discovered. It was first reported in 1915, and this was followed by the clinical introduction of nalorphine (N-allylnormorphine) in 1954, naloxone (N-allyloxymorphone) in 1960, and naltrexone (N-methylcyclopropyloxymorphone) in 1963. Nalmefene (6-desoxy-6-methylene-naltrexone), another structurally related opioid antagonist derivative, was also subsequently introduced, in 1996. 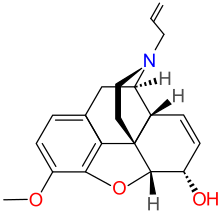 In animals, nalodeine both reverses morphine- and heroin-induced respiratory depression and acts as a respiratory stimulant in its own right (i.e., when given alone). Similarly to nalorphine, nalodeine has also been found to act as an agonist of the κ-opioid receptor. ↑ Gavril Pasternak (17 April 2013). The Opiate Receptors. Springer Science & Business Media. pp. 4–. ISBN 978-1-60761-990-1. 1 2 Anil Aggrawal. APC Essentials of Forensic Medicine and Toxicology. Avichal Publishing Company. pp. 554–. ISBN 978-81-7739-441-2. ↑ Robert M. Julien; Claire D. Advokat; Joseph E. Comaty (8 October 2010). Primer of Drug Action. Worth Publishers. pp. 349–. ISBN 978-1-4292-3343-9. ↑ Bentham Science Publishers (April 1995). Current Medicinal Chemistry. Bentham Science Publishers. pp. 423–. ↑ Cho N, Hirobe M, Takayanagi I (1985). "Effects of epoxidation on the actions of normorphine, norcodeine, N-allylnormorphine(nalorphine) and N-allylnorcodeine on the electrically stimulated guinea pig ileum" (PDF). Chem. Pharm. Bull. 33 (4): 1681–6. doi:10.1248/cpb.33.1681. PMID 4042244.